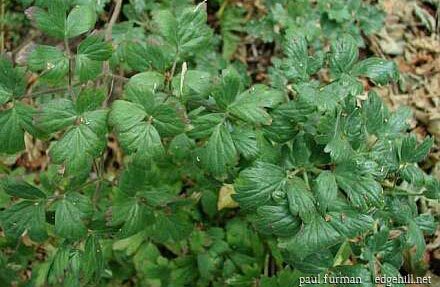 You are probably familiar with Aquilegia formosa. Sepentine Columbine very similar but easier to grow in a native garden because it is more drought tolerant, more sun tolerant and less prone to mildew or spittle bug damage. 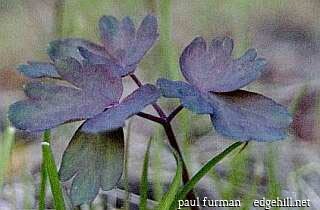 Sepentine Columbine has sticky oil on the leaves which protect it and the leaves will get a purple color in the sun. The plants can get very large in rich well watered garden conditions; up to four feet tall but in normal native garden conditions it is a normal 18 inches or so. 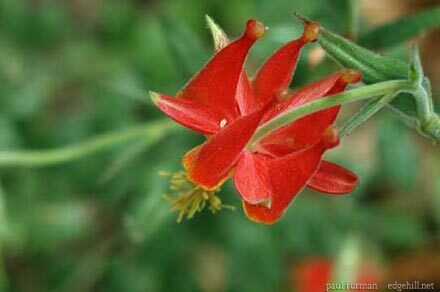 Columbines bloom in the summer heat for months with a bit of extra water and go dormant in winter, dying back to the ground. They reseed readily if there is some bare soil and not too much competition. Sticky leaves as they look in the shade. An extreme case of purplish leaves. You will only see this in harsh dry gravelly, serpentine soils or hot sun. The flower is a little bit paler than formosa, a little more compact.